Used with permission by Ben Brausen Click image for link.. In my book, stickers are way more fun than emojis. More color, more detail, and now, more Minnesota! 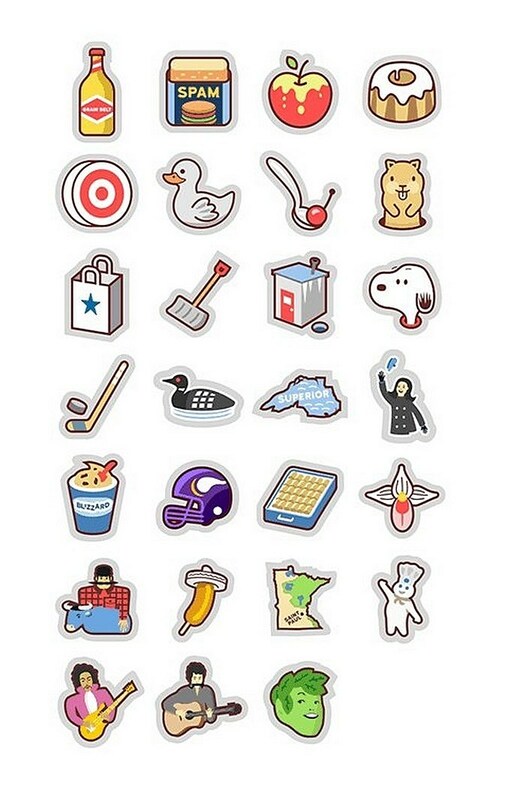 You can get stickers for your messages like Prince, Spam, corndogs and more for your iPhone. You can get them in the App store by clicking here. I love the Tater-Tot Hot Dish, Prince, of course, Bob Dylan, and the Jolly Green Giant! By the way, did you know you can visit the Jolly Green G? It's true! He lives in Blue Earth, MN. Years ago I kissed his thigh, but sadly, the picture is gone. I run the Twitter account @BestPixMN, which showcases photos from across our great state. It inspired me to create this sticker pack filled with Minnesota icons, to add some fun to our communication. ii) What's your most requested sticker? More Minnesota sports teams have certainly been requested. It’d be great to represent all the awesome teams here in MN. Additional Minnesota icons would be great additions, like First Avenue, The Orpheum, and others. 3) Will Android users get a crack at 'em? Sadly, at this time Android doesn’t offer sticker packs which are integrated into the operating system in the same way iOS does. If Android was to add the ability, I’d happily release a sticker pack for the platform. Everyone hates the Snapchat update...will they go back? Samm found out!